When should I replace my smoke detector? Your smoke detector stands on guard all day, every day ready to alert you to a fire. Not surprisingly, all that work eventually wears these devices out and it happens faster than you might think. According to the National Fire Protection Association (NFPA), 17 percent of fire deaths happen in properties where the smoke detector failed. Knowing when to replace your smoke detector ensures you’ll always have a reliably functioning device protecting your family. Before you replace your smoke detectors, make sure you have the right amount in the right locations. If you’re lacking, it’s worth taking the time to plan a complete smoke alarm system. For the highest level of protection, choose a hard-wired or wireless interconnected system. In these systems, when one detector senses smoke, all the alarms in your home sound. A knowledgeable professional electrician can design a system for you and install the smoke detectors in the optimal locations. Every level of your home, including the basement, should have at least one smoke detector. Smoke rises, so mount your detectors on your ceilings or high on your walls, not more than 12 inches away from the ceiling. A detector should be installed within 10 feet of every bedroom or sleeping area. If a floor has no sleeping area, place the detector near the most used room or by the stairs leading to the next floor up. In the basement, place the detector on the ceiling at the bottom of the stairs. Keep your smoke alarms at least 10 feet from the kitchen or bathroom to minimize the risk of false alarms from cooking fumes or bathroom steam. Where possible, avoid placing them near windows, exterior doors, and air vents. The drafts these create can blow smoke away from the detector and delay its response to a fire. Once a month, test your smoke detector by holding down the test button for at least five seconds or until the alarm sounds. 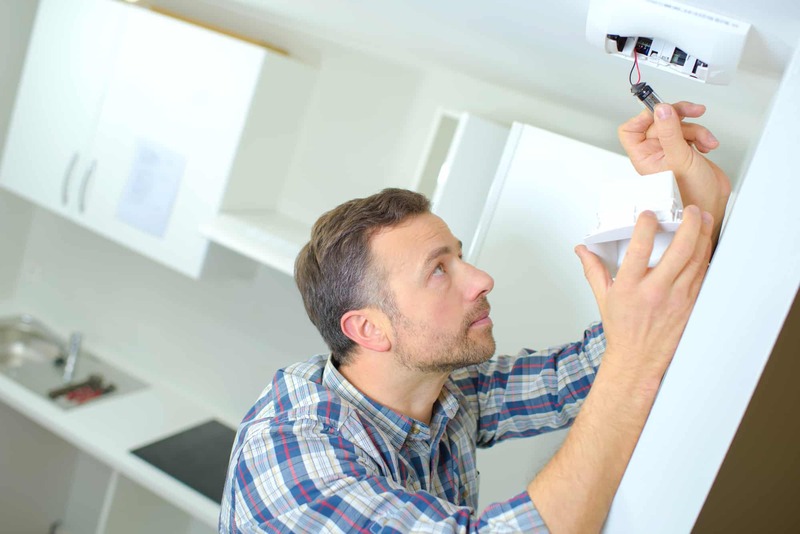 If the alarm is weak or doesn’t sound at all, replace the batteries and test again. If fresh batteries don’t help, it’s time for a new detector. After testing is a good time to dust or vacuum your smoke detector to clean out debris that could clog the sensor. Even when the test is successful, replace the batteries at least once a year. A beeping or chirping noise from your detector is also a sign the device needs fresh batteries. Alkaline batteries lose power over the year and while old batteries might power the alarm during a test, they could still be too weak to sufficiently power it during a real fire. If your smoke detector has a 10-year or “long-life” lithium battery, you won’t have to replace the battery during the detector’s life span. Replace each smoke detector after 10 years. This includes lithium-battery alarms and the alarms in hard-wired systems, as well as detectors that still test as functional. The test button only confirms the battery, wiring, and alarm horn are working, but it tells you nothing about the sensor. In many detectors, the sensors lose sensitivity over time or develop a buildup of dust that impairs their sensitivity. Ionization smoke detectors become more sensitive as they age, causing more false alarms. After a while, you’ll be tempted you remove the batteries and leave your home without protection. Contact Turn It On Electric if you need to replace or add smoke detectors to your home.